Since its founding in 1828, the STAUF company has been under family management. Wolfgang and Volker Stauf are now the sixth generation in the history of the company. The eventful history of the traditional company is closely linked to the economic changes of the Siegerland. Its turning point, and thus also the actual beginning of the STAUF Klebstoffwerk GmbH success story, began after the Second World War. In 1946, when two air attacks left the buildings and equipment of the STAUF glue factory in rubble, Dr. Werner Stauf experimented with synthetic raw materials in a poorly equipped kitchen in Siegen. His vision: To manufacture an adhesive that would ring in a new era for the family company. The hide glue which the company had been producing from animal skins was no longer economically viable. So while the visionary dedicated himself to his experiments at night, during the day he became known as the ‘soap man’ travelling through Siegerland. Up and down the mountains, from village to village, he rode his bicycle selling his hand-made soap. Times were hard. Like many families, the Stauf family had lost all they owned. His evening experimentation finally brought the hoped for results: With the invention of his first synthetic adhesive, Dr. Werner Stauf laid the foundation for the reconstruction of his company. By concentrating on adhesives for the construction industry, he opened up completely new sales markets for the company. When the first dispersion adhesive for wood flooring came on the market in 1952, the breakthrough was accomplished. Revenues increased with the introduction of the STAUF rapid-M2A – business was good, the transition was successful. The STAUF company was the only glue factory in the Siegerland region that made the transition from animal glue to synthetic adhesive. Dr. Werner Stauf has worked tirelessly and with vision to improve his products and bring countless innovations to life. The many patents granted by the German Patent Office in Munich which are in the company’s archives attest to that. Among other things, the chemist developed a procedure for bonding polystyrene foam boards to panels that can be used as roof covering to create a safe alternative for bonding with flammable bitumen. Eberhard Stauf already demonstrated the will to pioneer new approaches when he started a glue boiler next to his tannery in 1828. In the course of its history, STAUF Klebstoffwerk GmbH has developed from a small business to a modern factory. The far-sighted view and down-to-earth philosophy of the preceding generations have served the Stauf family well in spite of its huge growth and both are firmly part of the corporate philosophy. State-of-the-art technology and employees encouraged to think innovatively ensure a continuous optimisation of the high-quality adhesive systems for floors, walls and outdoor coverings. The reliable premium quality of the adhesive products from the Siegerland region is based on years of experience and continuous development of its product range. Eberhard Stauf built the first glue factory in the Siegerland region. His name still appears in the name of the incorporated company Eberh. Stauf GmbH & Co. KG. The history of the STAUF company also reflects the economic change that has taken place in the Siergerland region. The interplay of the mining, iron and steel making industries combined with the agriculture and forestry determined the development of the company. Its ability to develop from a small glue boiler to a modern adhesive factory also has a lot to do with its imaginative and far-sighted management character. Timber from the Siegerland woods made the livestock sector into the basis for a strong leather industry. The chronicles of the town of Siegen document that Johann-Jacob Stauf was already pursuing the trade of red tanner in 1654. Subsequent family generations also worked in this trade. Eberhard Stauf, the founder of the glue factory, was thus first and foremost a tanner. Many of the names of streets in Siegen are testimony to this past, such as Lohgraben (Tanning Ditch), Löhrtor (Tanning Gate) or Gerbereiweg (Tannery Way), even if the limestone mines and buildings have now disappeared from the city. When the Napoleonic Wars and the continental blockade stopped the import of animal hides from overseas at the beginning of the 19th Century, Eberhard Stauf was forced to tap a new source of income in addition to his leather manufacturing in order to financially secure his family’s well-being. Eberhard Stauf had the idea of using the waste from his tannery for making glue. From the production of 100 kg of sole leather, a full 14 kg of meat and fat waste remained, so-called “glue stock”. All of the parts not used in leather production were now sold as so-called glue stock to glue boilers. This new branch of industry gave the Stauf family a certain independence from the pricing of the leather industry that was increasingly influenced by production overseas. In the hide glue factories the glue stock first had to be cleaned and then stored in a milk-of-lime bath in the so-called "lime pits" for up to ten weeks. This loosened the fibre structure. In the subsequent glue stock wash, the lime residues were thoroughly rinsed out in special washing machines for about 48 hours using fresh water. Then the actual boiling operation began: The glue stock and water were heated up in large, open boiling vats in order to melt out the glue. Then preservatives were added to the concentrated bath, which was poured into low, rectangular boxes and placed in special cooling rooms to solidify it. After the cooling, the gelatine blocks were removed from the boxes and cut into manageable slabs, which had to be dried in special structures. Wilhelm STAUF, son of the company founder sold off the tannery and modernised the glue factory in Siegen. Following the death of the founder, Eberhard Stauf, his son Wilhelm took over management of the company in 1862 and modernised the glue factory. The traditional craft process for manufacturing hide glue remained unchanged until the late 19th century. But technical innovations made it possible to produce glue much more efficiently and all year round. Wilhelm Stauf also acquired interests in other companies not directly related to leather: Together with Eduard Giesler from Siegen and the industrialists Vollpracht and Weiss from Hilchenbach, he founded the felt factory "Stift Keppeler Filzfabrik". This was the largest felt factory in Germany processing animal hairs left over from the tanning shops for a time. The workers washed, dried and separated the animal hair and then pressed it into felt. As an entrepreneur, Wilhelm Stauf saw the signs of the times: He abandoned the now unprofitable tanning business and began a new chapter in the company’s history. The son of the company founder worked on opening up new iron ore mines as well as joining his son-in-law, Emil Pipers, in starting what is still an important rolling foundry today. The brothers Ernst (1862-1949) and Richard Stauf (1868-1956) led the company jointly through turbulent decades. When the brothers Ernst and Richard Stauf took over management of the company in 1900, a time of prosperity for the hide glue industry began. The technical production processes introduced led to major improvements in glue quality. Before the boiling operation, it was possible to drain the glue stock in presses and then heat it gently using steam. The ten-percent glue broth then no longer had to be boiled openly, but was brought up to a glue content of 30 to 45 percent in a vacuum evaporator. From the rigid gelatine, slabs were again cut which then only had to dry for 10 to 14 days in a heated drying structure. But times became more difficult. The mines and the iron and steel industry in the Siergerland were fighting competition from the Ruhr. By this time, charcoal had long fallen out of use as a fuel for domestic blast furnaces. Since the livestock sector, which was closely linked to wood production, was also suffering from these circumstances, the glue factories could not longer meet their needs for raw materials from the local tanneries. A large portion of the glue stock had to be imported from overseas. That intensified the already precarious situation in many companies. Even at Stauf, procuring raw materials for the glue factory was increasingly difficult. At the beginning of the 20th Century, the Northern German regions began exerting increased pressure on the leather industry in the Siegerland because they could produce leather faster and more cheaply. Ready-made imported products also began having their effect, which made procuring raw materials for the regional glue factories an existential threat. The leather tanned in the large glue factories in Hamburg and Schleswig-Holstein was done with special quebracho wood and was only limitedly suitable for glue production. Of the approximately 140 hide and bone glue factories which had existed in Germany prior to the First World War, only 88 were still in operation in 1920. The First World War ultimately ended the rise in the hide glue industry in Siegen and was a turning point in the history of the STAUF company. Although the demand for glue continued unabated, the confusion caused by the war and the lack of raw materials rendered profitable production impossible. As a result, the Stauf brothers were forced to shut the glue factory down from 1915 until 1920. Of the approximately 140 hide and bone glue factories which had existed prior to the First World War, only 88 were still in operation in 1920. In the post-war years the hide glue industry experienced a brief upturn until 1923. But as world trade was reorganised, competition on the raw materials market also intensified. The economic crisis and the political unrest from1929 on destroyed any hope of recovery. was also known as the "Siffemann" (soapman) because he went from village to village on his bicycle selling home-made soap. When Dr. Werner Stauf took over management of the paternal business in 1930, conditions were difficult. The National Socialists were in power and the "Reich Chemicals Agency” subjected glue stock to strict quotas. The STAUF company was forced to severely cut back production. In December 1939, a state order was even issued to close down the STAUF glue factory and make it part of a so-called workers cooperative. The politically motivated compartmentalisation of the international procurement market for hide glue led to a state ordered closure of the STAUF glue factory in Siegen in December 1939. The glue stock quota of the Siegen hide glue factories was processed in the Freudenberg glue factory of Otto Nöll from 1940 onwards. And so – as was often the case in the history of the Stauf company – necessity was the mother of a new era of inventiveness: Dr. Werner Stauf, who had gained his doctorate at the University of Leipzig with a thesis on gelatine at the age of 25, developed a method for recovering hide glue from abrasive paper and abrasive cloth waste. This discovery made it possible to resume production: From 1941 to 1944, all abrasive wastes from Germany were recycled in the Siegen factory. But this method of production at the STAUF company also came to an abrupt halt before the end of the Second World War: Two air raids on 16 December 1944 and 1 February 1945 destroyed the company’s entire production facilities and all the raw material and finished goods stocks. The STAUF family lost its entire assets. After the end of the second World War, Dr. Werner Stauf made a virtue out necessity: He decided not to resume hide glue production. For decades the odour nuisance from the animal waste products had continually led to conflicts with people living around the factory and to restrictions imposed by the authorities. Instead Dr. Werner Stauf developed a new kind of glue made from surplus soluble glass. A new course was set with the discovery of viscid cold glue and the STAUF company was reborn again. The great success of the application of synthetic raw materials created the economic basis for rebuilding the company. And that meant a huge change for the adhesive industry in Siegerland because the viscid cold glue could be used to glue hardboard to concrete. This enabled Dr. Werner Stauf to lay the foundation for a specialisation in construction adhesives. In the subsequent period, Dr. Werner Stauf concentrated completely on setting up a manufacturing division for dispersion adhesives. In 1952, the first dispersion adhesive for full-spread glueing of wood flooring was launched onto the market in the form of the "STAUF Rapid-M2A". The wood flooring sector soon gave Dr. Werner Stauf the official confirmation: “STAUF Rapid-M2A” was the adhesive that experts had been waiting for to bond mosaic parquet to absorbent substrates. was also called "Mr WFR" because of the great success he had with his solvent-based wood flooring adhesive. Following in the footsteps of his father, Helmut Stauf continued the legacy of Dr. Werner Stauf by systematically focussing the company on construction chemical products and the needs of the construction industry. He also concentrated heavily on marketing in Germany and abroad. The STAUF company was thus set to develop into a leading enterprise in the area of flooring adhesives. The steady growth of the company soon required new and larger machinery. However, Helmut Stauf did not want to use investment capital for to purchase them: Instead, he mastered the challenges through inventiveness and improvisation. The development of the WFR wood flooring adhesive on a synthetic resin solvent basis and the dispersion-based "M2A" line made a major conversion necessary at the beginning of the 1970s. The expansion allow STAUF completely new possibilities for its production capacities. The requirements for improved user and consumer protection increased over the following years. Helmut Stauf responded to this development by creating two universally applicable adhesives based on polyvinyl acetate dispersions: Type “Rapid M2A-712” and “Rapid M2A-720”. Other improvements for bonding of wood flooring were achieved later by developing adhesives based on polyurethane. Helmut Stauf also introduced an extensive range of accessories in order to expand the product range to form a harmonised system for safe and secure wood flooring and floor covering work. But there was hardly enough space for more products. Since all of the expansion possibilities had already been exhausted during the 1970s expansion, the urgently needed additional warehouse capacity could not be realised in Siegen. When it was time to expand the company again in the mid-1990s, Helmut Stauf decided to look for a suitable property outside of Siegen for erecting a completely new adhesive factory. He chose the industrial area of Lehnscheid in Wilnsdorf with direct motorway access. The Wilnsdorf city council gave him an approval at the beginning of 1998 to purchase the property and build a new adhesive factory. The history of the STAUF company took an unexpected turn that same year. Helmut Stauf suddenly died. The relocation plans could not be pursued further. From one day to the other, the family business needed to be reorganised. Both of Helmut Stauf’s sons had grown up with the company, however they were both still in school. His wife, Siegrid Stauf, who had worked as an authorised officer in the company for years, took the helm of the company with her older son Wolfgang Stauf. After Helmut Stauf’s death, Siegrid Stauf and her son Wolfgang dedicated themselves to creating a sales structure abroad and worked towards completing the product range. 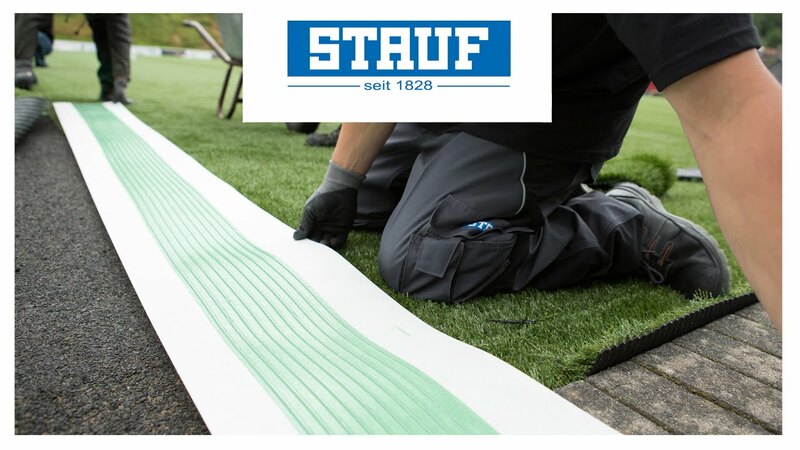 STAUF customer support at home, which had previously been provided through independent commercial agents, was now delegated to the company's own personnel, and new products were regularly brought onto the market. The workforce was soon not large enough to handle all the new technologies, the constant product developments and the quality assurance of existing products. The number of employees in the laboratory was doubled. The plant in Siegen proved to be more and more of a compromise: the continued complexity of production at the old site could only be compensated by constant improvisation. Low and narrow passageways, long routes and little space made internal company logistics a constant headache. In spite of the difficult conditions, it was possible to set up a production line for the PPK-880 powdered wood flooring adhesive. However, by the beginning of the new millennium, all storage capacity had been exhausted. The small conversions which had been used to create space short-term were simply no longer possible. By 2000 it was clear: The STAUF adhesive factory would get new company headquarters. That spring, a contract was finally placed for the construction of a new factory in Wilnsdorf. On 5 March 2002, the symbolic first shovel of dirt was dug to mark the beginning of construction. That same year, Volker Stauf was appointed managing director. This meant that, together with his brother Wolfgang Stauf, the company passed the baton to the sixth generation. The first adhesive came off the production line in the newly built plant in Wilnsdorf in October of the same year. As more and more equipment was commissioned there, Volker and Wolfgang Stauf gradually shut down production at the factory in Siegen. Production ran parallel in both plants until the end of 2002. Then, on 16 December 2002, the last official production was completed and the STAUF plant in Siegen was closed. About two weeks later, the dismantling of the old location began. There was not a lot of time to disassemble the equipment and machines, and some components were needed to continue service at the new location. With the commissioning of the new factory and closure of the old one, the continuing development of the STAUF company has been given a firm foundation. Now we have to begin to shape the future. Globalisation presents many challenges to the family owned and operated STAUF company. The internet and new media channels have created almost unlimited transparency on the market. STAUF will have to face the challenge of developing new strategies for selling high end adhesives. Residential and commercial buildings are completed in increasingly shorter times. This demands products with the same processing quality but in compliance with occupational and consumer protection requirements. "A good company that wishes to survive must remain young, dynamic and mobile and must develop new, creative ideas day after day"